The Yankees played an awful game against the last place Diamondbacks, but somehow lived to tell about it. Even Mariano Rivera, who walked a tight wire in the tenth, expressed his frustration by calling the team’s effort terrible and unacceptable in a post game interview. Still, the Yankees managed to escape from the desert with two wins despite playing some of their worst baseball of the season. 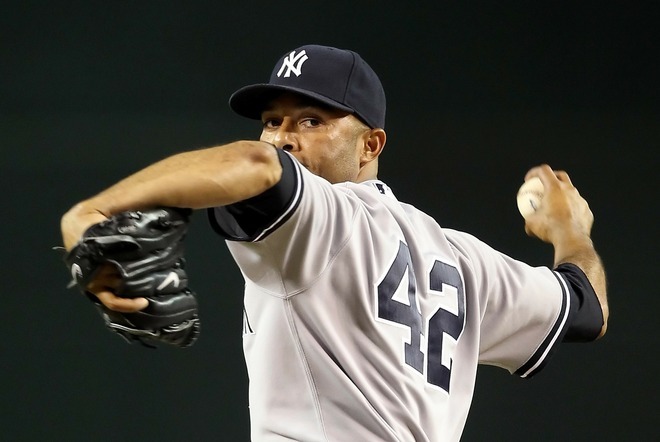 Mariano Rivera not only delivered a save, but also a message to his teammates about their lackluster play (Photo: AP). At the start, the game looked as if it was going to be a laugher because Dontrelle Willis seemed incapable of throwing a strike. However, after Nick Swisher singled in Derek Jeter with the game’s first tally, the Yankees proceeded to run themselves out of the inning when both Swisher and Mark Teixeira were thrown out trying to steal. The Yankees would squander several more golden opportunities to bury the Diamondbacks, including two double plays by Robinson Cano. The first one was a routine ground ball double play with the bases loaded in the third, but the second resulted from an amazing catch by Gerardo Parra in the fifth. With Teixeira on second and Arod on first, Cano lashed a line drive to deep left that seem destined to be a two run double. However, Parra got a great break on the ball and made a full body dive while running back toward the wall. With the ball in glove, Parra popped up and initiated the relay that nabbed Arod at first to end the inning. While the Yankees were squandering opportunities, Javier Vazquez was struggling with his command. In both the first and third innings, he surrendered two run singles to Adam LaRoche, whose four RBIs helped push the Dbacks into a lead that they held until the Yankees tied the game in the sixth. In that inning, Colin Curtis, who pinch hit for Vazquez, knocked in the tying run with a hard hit single off the glove of LaRoche. The tie was short lived, however, because Damaso Marte added to the Yankees comedy of errors by walking Chris Young, balking him to second and throwing a wild pitch that sent him to third. Young would eventually score the go ahead run on a comebacker. The abysmal Dbacks bullpen was able to keep the Yankees scoreless in the seventh and eighth, but Aaron Heilman was unable to slam the door in the ninth. After walking Jeter and Swisher to lead off the inning, Teixeira moved both runners up with a groundball to first before Arod plated the tying run with a sacrifice fly. The Yankees had the chance to take the lead, but Francisco Cervelli struck out to end the threat. After scoreless innings from David Robertson and Joba Chamberlain, Joe Girardi made the unorthodox (but correct) decision of using his closer in the bottom of ninth of a tie game. Rivera struck out the first two batters of the inning and then narrowly escaped trouble when Kelly Johnson flew out to the right field wall. By using his closer to extend the game, Girardi bought time for his offense in the tenth. Leading off that inning, Curtis Granderson blasted a go ahead home run deep into the right field seats that gave the Yankees a 6-5 lead. The next two batters also reached base, but Derek Jeter bounced into his second double play of the game. Despite taking the lead, the Yankees squandered yet another chance to break open the game when Rivera, who was left in to hit, grounded out to end the inning. Because they had played so poorly and squandered so many opportunities, you just knew the game would not end quietly. Stephen Drew promptly lead off the bottom of the tenth with a bloop single and then Justin Upton lashed a 0-2 pitch into the left field corner. Quick fielding by Gardner kept Drew at third base, but that only seemed like a formality at the time. After walking Miguel Montero to load the bases with no outs, however, it appeared as if Mo simply decided that the Diamondbacks would not score another run. Sure enough, Rivera used his devastating cutter to pop up both Young and LaRoche before striking out Mark Reynolds to extinguish the threat and salvage the victory.